Signature steak spice, arugula, ranchero yogurt. Charbroiled patties, havarti, caramalized onions, pickels & signature sauce. Hand breaded & served with honey mustard or plum dip. Skinny fries topped with cheese curds, gluten free gravy & fresh parmesan. Bacon, caramelized onion, scallions, sour cream. Blackened chicken strips with ranchero yogurt. Roasted grape tomato sauce, fresh basil, shaved parmesan. Garlic toast. Korean BBQ marinade & spices. Assorted cheeses, cured meats, nuts, pickles,grainy mustard, arugula, strawberries, red pepper jelly & artisan crackers. 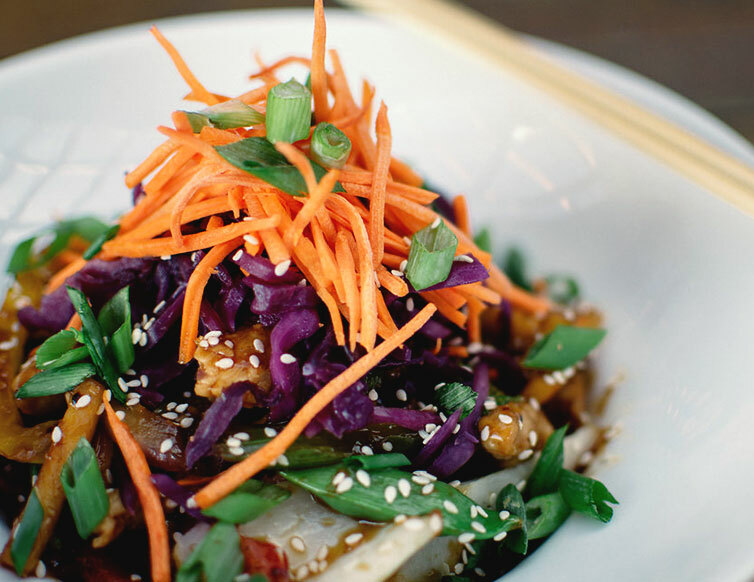 Wok chicken, szechuan, hoisin, ginger, sesame seeds, carrot, sweet peppers, crispy farkay noodle, toasted cashews. Head lettuce. Pulled short rib, melted cheddar, avocado, corn, black beans, salsa & habanero slaw. 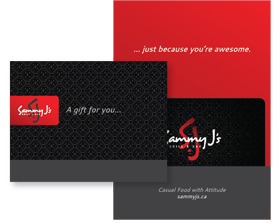 Hot, mango habanero, cajun, teriyaki honey garlic, hotty-yaki or salt & pepper. Celery & ranch dip. Ahi tuna, macadamia, avocado, jalapeno, ginger soy, sesame seed, onion & wasabi aioli on wonton crisps. Fried russets, cheese & smoked bacon baked on a cast iron skillet. Topped with scallions & served with ranchero yogurt dip. Cajun chicken, roasted corn, cheese, black beans, banana peppers & scallions in flour tortillas with salsa & sour cream. Mom’s recipe, creme fraiche & homemade coutons. Grilled chicken, roasted garlic caesar dressing, croutons, parmesan cheese. Panko breaded chicken breast, crisp greens, strawberries, avocado, candied pecans, goat cheese, red onions & poppy seed vinaigrette. Cubed ahi tuna, seasonal greens, avocado, scallions, crispy wontons, pineapple, jalapeño, macadamia nut, onion, sesame ginger dressing & wasabi cucumber drizzle. 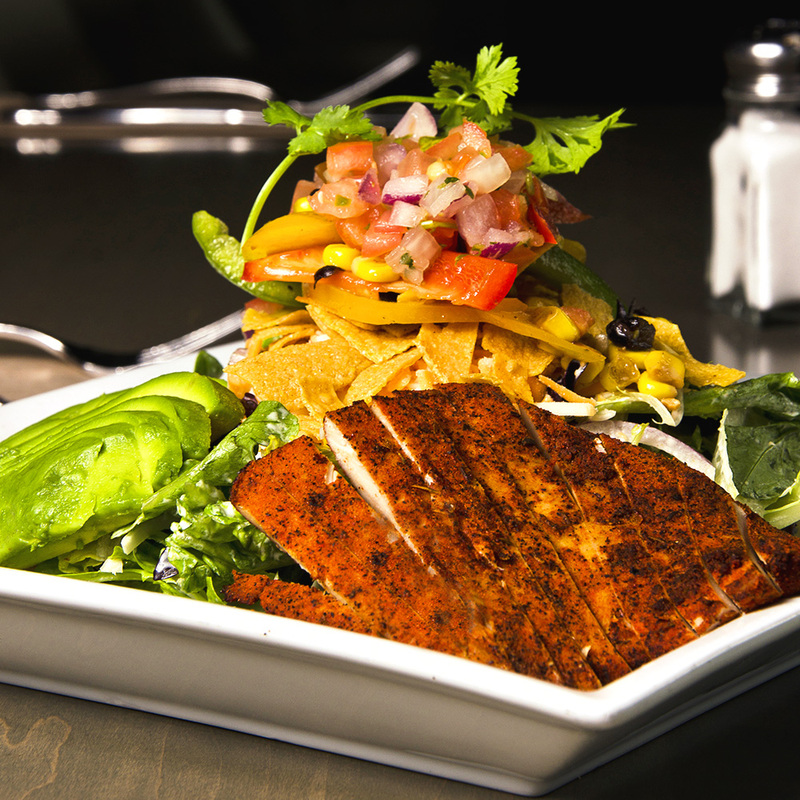 Blackened chicken, seasonal greens, sweet peppers, salsa, red onion, roasted corn, black beans, cheese, corn tortilla, avocado & ranchero yogurt. Grilled chicken, quinoa, seasonal greens, snap peas, avocado, grape tomatoes, pumpkin seeds, feta & apple cider vinaigrette. BBq chicken breasts baked with mushrooms, aged cheese & smoked bacon. Served with seasonal vegetable over white cheddar mashed potato. Wild Sockeye filet simply seared with garlic, shallots & fresh dill. Served with quinoa, snap peas & seasonal vegetables. With cucumber yogurt. 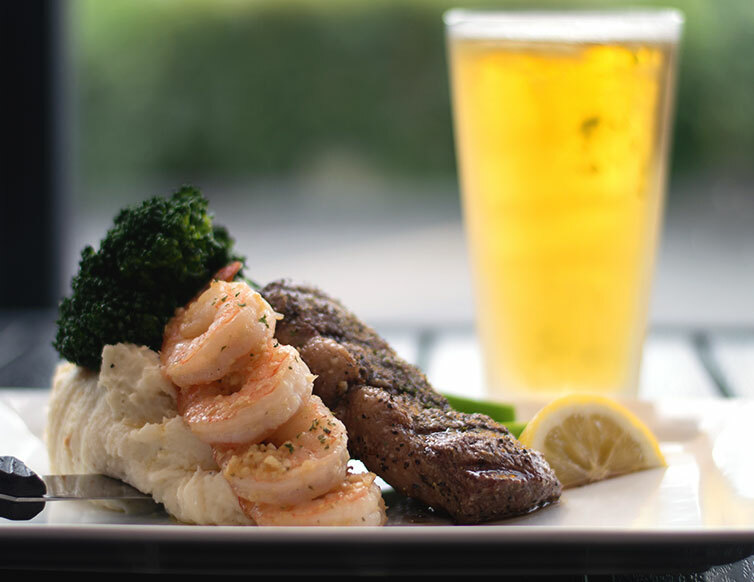 Certified Angus Beef® sirloin, scallops, prawns, cajun cream, scallions, hot sauce & seared vegetables served over white cheddar mashed potato. With peppers, onions, salsa, sour cream, guacamole, lettuce, cheese & flour tortillas. Farkay noodle, peanuts, asian vegetables, cilantro, coconut peanut sauce. You choose how many hunan peppers. Spicy panang curry, carrot, chick peas, cauliflower, cashews, red onion, garlic, sweet peppers, tomato, creme fraiche, fresh basil & rice with grilled naan. You choose how many hunan peppers. Teriyaki chicken, rice, sweet peppers, snap peas, bok choy, broccoli, braised cabbage, onion, carrot, sesame seeds & spicy yogurt. with rice, bacon, black beans, corn, creole sauce, spicy yogurt. Garlic toast. 4 cheese sauce, bacon, scallions & a blackened chicken breast. Garlic toast. Mushrooms, sweet peppers, cajun creamed alfredo, parmesan & scallions. Garlic toast. Prawns, scallops & mussels in a garlic alfredo sauce with scallions & grape tomatoes. Garlic toast. Hand-rolled meatballs, grape tomato sauce, fresh basil, shaved parmesan. Garlic toast. 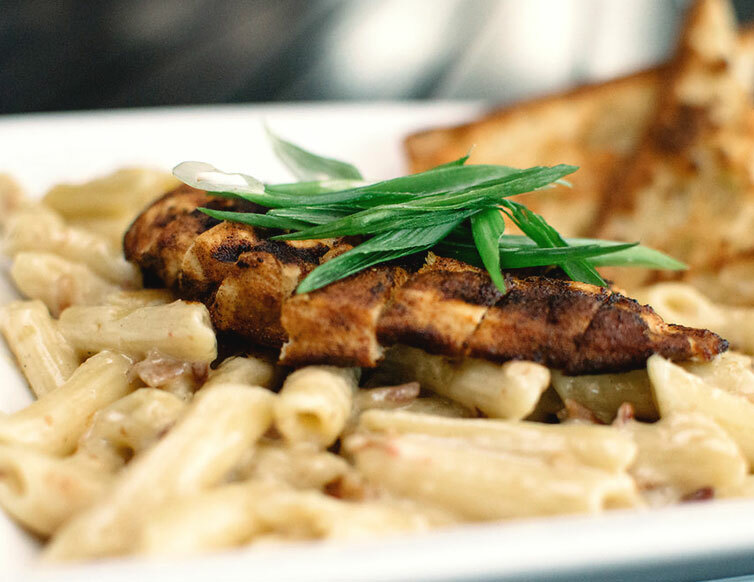 Seared chicken, pesto cream, roasted red peppers & shaved parmesan. Garlic toast. Chorizo, genoa salami, bacon, red onion, fresh jalapeño, mozzarella & feta. 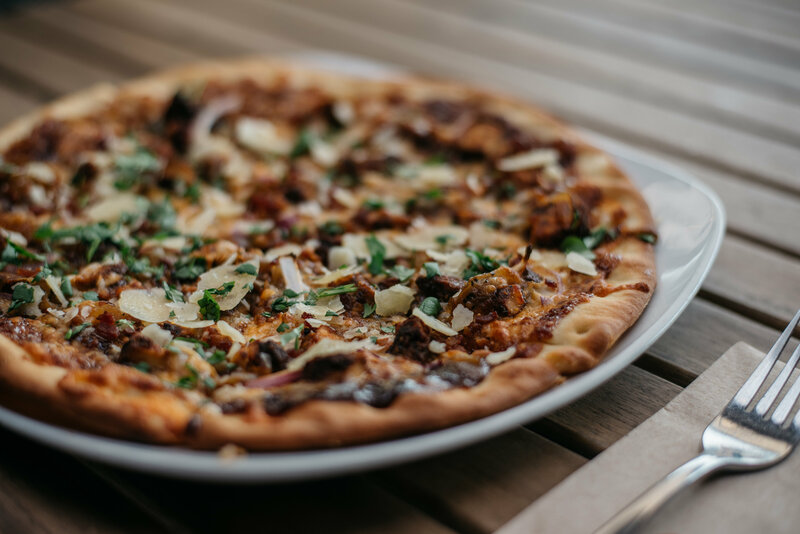 Blackened chicken, honey bourbon BBQ sauce, caramelized onions, cheddar, red onion, cilantro & parmesan. tomato sauce, mozza, goat cheese, baby spinach, roasted peppers, caramelized onion, roasted garlic, red onion, & grape tomato. With fresh basil & pesto cream drizzle. Wok seared BBQ chicken, bacon, snap peas, carrot, celery, rice & egg sauteed with soy sauce. Garnished with green onions. Served with fries, tomato soup or salad. Sub tater tots or yam fries $2 Sub veggie patty on any burger or sandwich, no charge. 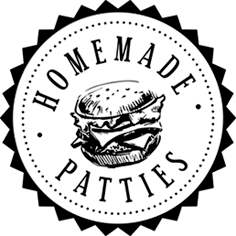 Dad’s patty recipe. Lettuce, tomato, pickles & signature sauce. Served on toasted brioche bun. Beef patty, aged cheddar, bacon, mustard, lettuce, red onion & tomato on a toasted brioch bun. Crispy chicken, jalapeno jack, sriracha ranch, fresh jalapenos, tomato & habanero slaw in a flour tortilla. Blackened breast, BBQ sauce, cheddar, bacon, lettuce, red onion, tomato & mayo on ciabatta. Grilled chicken, brie, havarti, apple mango jam, garlic aioli & spinach pressed between 7 grain bread. 6oz Certified Angus Beef® with crispy onion & arugula served open face on toasted garlic bread. Panko chicken breast, jalapeno jack, honey mustard drizzle, tomato & sriracha ranch coleslaw on a toasted brioche bun. 2 peices of battered cod served with coleslaw, fries & house made tartar sauce. 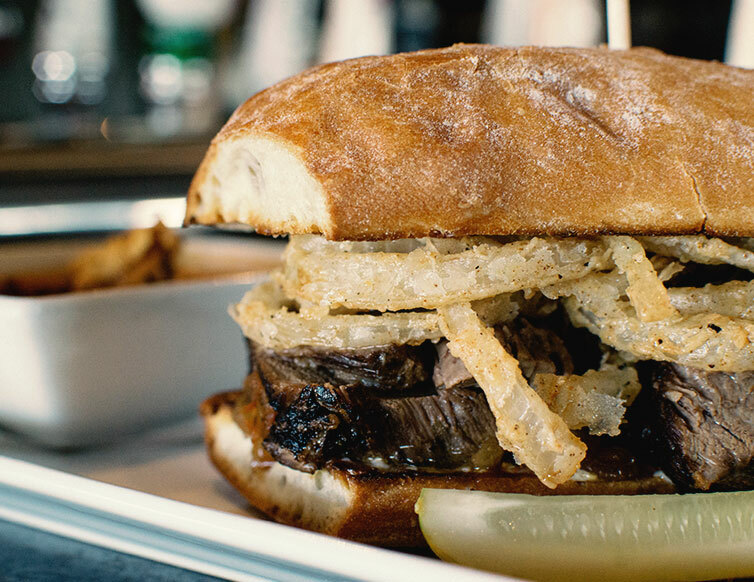 Toasted ciabatta, double-braised short rib, crispy onions, caramelized onions, horseradish dijon mayo & au jus dip. Grilled garlic naan, cucumber, spinach, tomato, red onion, chick peas, roasted red peppers, goat cheese, avocado & garlic aioli spread. Battered cod, habanero cilantro slaw, salsa, tarter sauce & ranchero yogurt drizzle on flour tortillas. 6oz pan seared filet with fresh dill, garlic, pepper, course salt & lemon. Served on a toasted brioche bun with arugula, habanero cilantro slaw, creme fraiche & tomato. Dark chocolate & peanut butter mousse full of Reese’s Peanut Butter Cups. Traditional rich & creamy cheesecake topped with strawberry compote & whipped cream. Warm chocolate brownie, vanilla ice cream topped with real whipped cream & chocolate sauce.